MESA, Ariz. – After a late rally, the University of Antelope Valley Pioneers (14-4; 4-1 Cal Pac) would go on to win in overtime on Saturday, defeating the Redhawks of Benedictine University at Mesa (5-9; 1-4 Cal Pac), 77-74, in intercollegiate California Pacific Conference women’s basketball action inside Heap Gymnasium. After suffering their first Cal Pac loss of the season two days ago in overtime against Embry-Riddle, the Pioneers would find themselves trailing to Benedictine-Mesa at halftime by a small margin, 37-35. 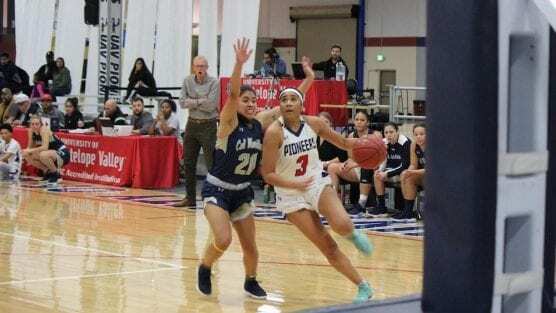 The Redhawks would increase their advantage in the third period, outscoring the Pioneers, 16-13, but UAV would rally late in the final period of regulation, capped off by a clutch, two-point shot sunk by UAV senior guard Samantha Earl (Clovis, CA) with just two seconds remaining to tie the game, forcing overtime. Benedictine-Mesa scored the initial basket of the overtime period, but the Pioneers would gain the lead with 2:54 left on the clock, and despite losing the lead once more, UAV would continue to fight, retaking the lead with just 1:05 remaining and would not lose it again as they would go on to earn the hard-fought overtime victory, 77-74. Earl and junior forward Tylen Price (Lancaster, CA) led all Pioneers with 15 points each and also combined for eight rebounds, three assists, two steals, and one block, and junior guard Asia Young (Kansas City, MO) added 12 points and seven rebounds. Senior guard Alyssa Gonzales (Bakersfield, CA) totaled 10 points, senior guard Ilianna Blanc (Los Angeles, CA) contributed nine points, three rebounds and two steals, and senior guard LaChae McColor (Honolulu, HI) dropped eight points and pulled down seven boards. UAV hit 28-of-71 field goals (.394), 6-of-25 three-pointers (.240), 15-of-24 free throws (.625), and grabbed an even number of rebounds with the Redhawks, 43-43. The Pioneers committed 15 turnovers and stole the ball 13 times. BENU made 24-of-58 shots (.414), 9-of-21 three-pointers (.429) and 17-of-24 free throws (.708) and committed 24 turnovers and stole the ball from UAV six times. Next game: Coached by Deon Price, the Pioneers return home to host Simpson University for California Pacific Conference contest on Thursday, Jan. 17 at 5:30 p.m. PST inside the Pioneer Event Center (PEC) in Lancaster, Calif.